The variation of light intensity has obvious effects on leaf external morphology, internal anatomy, and physiological characteristics; it even induces changes in secondary metabolite production. The effects of different irradiance levels on biomass, gas exchange parameters, and photosynthetic pigment contents in Mahonia bodinieri (Gagnep.) Laferr. were analyzed here. 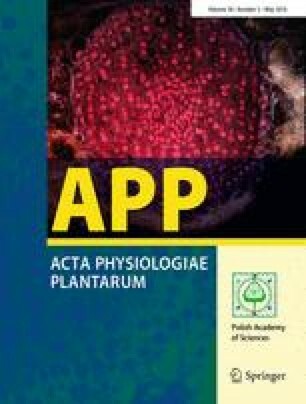 Combined analyses of physiology, cytology, and HPLC were used to study the differences in leaf morphology, structure, physiological characters, and alkaloid content in response to different irradiances. The results indicated that the highest foliar biomass was observed under I 50 (50 % of full sunlight) followed by I 30 (30 % of full sunlight), the highest net photosynthetic rate, stomatal conductance, transpiration rate values were observed under I 30 followed by I 50, and lower values occurred in I 10 (10 % of full sunlight) and I 100 (full sunlight). With increased light intensity, total leaf area and the contents of chlorophyll a (Chl a), chlorophyll b (Chl b), and chlorophyll (Chl a+b) per unit leaf area were clearly reduced, whereas leaf mass per area, carotenoid content, leaf thickness, thickness of palisade and spongy parenchyma, and stomatal density were all significantly increased. Electron microscopic observation revealed that the number of grana, stroma lamellae and the number of starch grains in chloroplasts were decreased, the number of plastoglobuli was increased when irradiance levels increased. The estimated total yield of alkaloids in a single plant was higher under I 30 and I 50 than under I 10 or I 100 as a result of the higher biomass of the plants. Therefore, I 30 and I 50 were not only beneficial to increase biomass, but also suitable for the synthesis and accumulation of the major secondary metabolites (alkaloids). Our findings provide valuable data for the determination and regulation of irradiance levels during artificial cultivation of M. bodinieri. De-Xin Kong and Yan-Qun Li contributed equally to this work. This work was supported by the National Natural Science Foundation of China (Project No. 31470293) to HW. The PhD Start-up Fund of Natural Science Foundation of Guangdong Province, China (S2012040007655) to MB. The Guilin city scientific and technological achievements transformation and application project (20100103-6), the Guangxi Scientific Research and Technological Development Plan (No.GuiKeZhuan1346004-29) and Guangxi Natural Science Foundation Program (2011GXNSFB018096) to DK.